Wagashi of Huryu-Uchiwa fuyaki-senbei ( Japanese rice cracker) Firstly you will say it is so cute and enjoy a painting drawn on this rice cracker. This fuyaki-senbei has the form of the round fan(Uchiwa fan). Uchiwa fan is a tool to make a wind by fanning it. Of course you can not make a wind with it because it is sweet, but Japanese people feel a small thing cute traditionally. 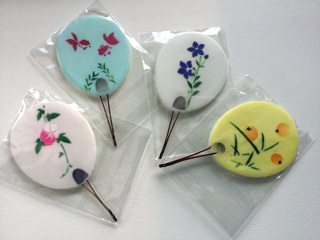 A goldfish, a firefly, a morning glory and a Chinese bellflower are drawn on these sweets. Looking at them, people feel joy of summer season. When you eat this Huryu-Uchiwa fuyaki-senbei,it melts gracefully in your mouth like fu(wheat gluten), but to tell the truth it is made of the glutinous rice. Fuyaki-senbei has the old history. It is said that it was offered at Kitano tea party of Toyotomi Hideyoshi, and it was liked as sweet for tea by the great tea ceremony master Senno Rikyu more than 400 years ago.